Cambodia has a lot of wonderful attractions to offer. You can visit some histrionic and naturally beautiful places in the country that you have never seen before. You can visit Sen Monorom which offers a lot of naturally beautiful landmarks for any visitor to enjoy. Let us find out about a few things to do in Sen Monorom Cambodia. If you like to see the wildlife in Sen Monorom, then you probably can visit Seima Protected Forest that is very large forest. 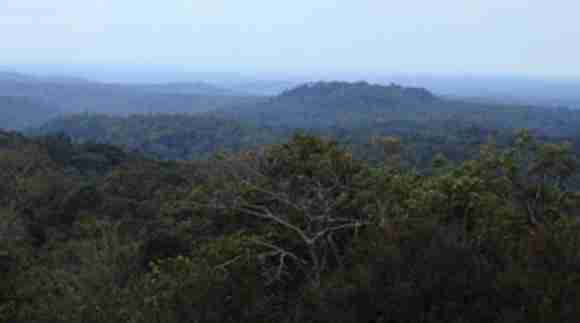 The area of Seima Protected Forest is about 3000 square km and it becomes the biggest national park in the country for mammalians wildlife. 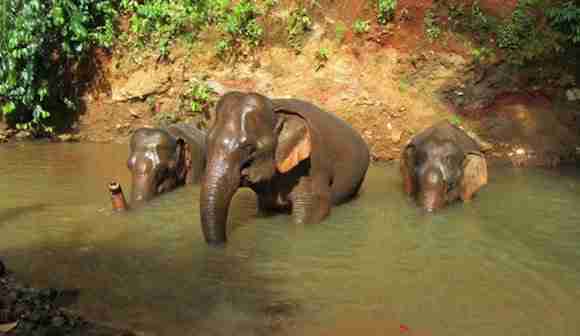 This will be an amazing spot in Cambodia that you must visit, especially if you really like wildlife animals. Sen Monorom has some beautiful waterfalls that are worth to visit. One of which is Dak Dam waterfall that you can reach from Sen Monorom about 25 km. Though it is quite far from the town, many visitors are willing to visit this waterfall when they come to Sen Monorom. However, the location of the waterfall is also quite isolated and it is not easy to get there. You are recommended to rent a motorbike and hire a tour guide for safety. Another option, if you do not want to visit Seima Protected Forest because it is too wild, then you probably can enjoy the beautiful Sen Monorom nature by visiting Bou Sra Waterfall which you can find in the jungle of Sen Monorom. It also belongs to the most amazing waterfall in the country and it is quite popular among tourists. The height of the waterfall is about 10 meters and it really looks spectacular with the combination of green forest view. Cambodia is the paradise of temples such as Angkor where you can find so many beautiful pagodas across the country. As you can also find one in Sen Monorom and it is called as Wat Phnom Doh Kromom. The Wat Phnom Doh Kromom temple offers a wonderful view of the sunset with its amazing wooden platform. Anyway, this temple can be a great spot for a visit. This should be on any list of things to do in Sen Monorom Cambodia. Especially, if you really like eco-tourism that offers nature and wildlife. 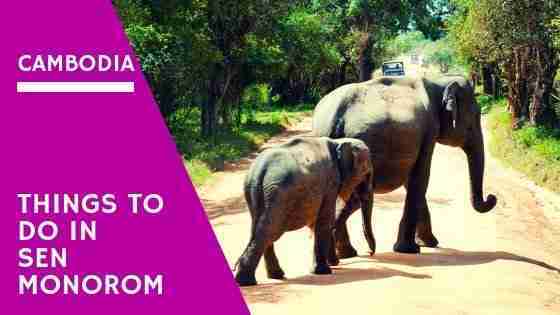 Elephant Valley Project is the best choice just in case you want to see some amazing elephants which you may not find in your country. Sen Monorom has an elephant area for any visitors who enjoy the experience of learning about these beautiful elephants and interacting with them. 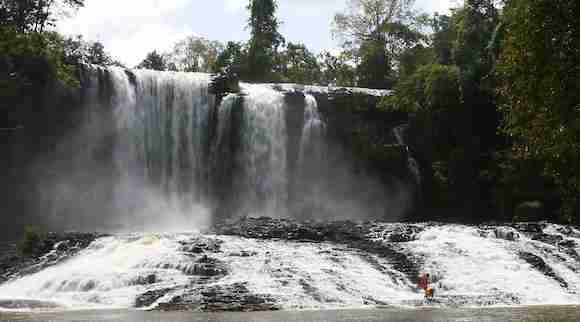 Instead of Dak Dam waterfall, Romanear waterfall is also quite popular among tourists who visit Sen Monorom during holiday time. However, this waterfall is not high as Bou Sraa waterfall and it is relatively low. You can find some swimming holes in this area, but you may take about 20 minutes to get to the location. In addition, you may not be able to get there without assistance. So, make sure that you visit this waterfall accompanied by a tour guide. According to its name, Coffee Plantation Resort is a beautiful place where you can see so many coffee plantations. You probably want to enjoy the local coffee drinks. 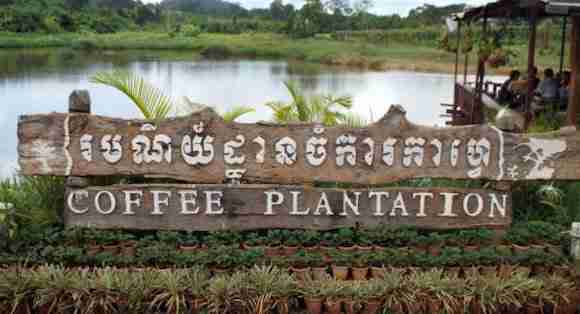 You have to know that Cambodia also has the most delicious coffee in the world. So, why don’t you take some coffee products from Cambodia and make some cups of coffee when you finally arrive at your hometown. Your trip to Sen Monorom will not be complete without trying a typical Cambodian meal. Simply, you can find some local restaurants in Sen Monorom and enjoy some delicious meals provided. Some of the typical meals that you may try are Ang Dtray Meuk, Khmer Red Curry, Fish Amok, and much more. Sen Monorom has a limit supply of guest houses, hostels and hotels. Here are a few places to check out and give you an idea of what is available in Sen Monorom if you are planning to visit Sen Monorom. Avocado Guesthouse provides free WiFi and rooms with air conditioning in Sen Monorom. Every room is equipped with a flat-screen TV with cable channels. And a private bathroom. All rooms include a desk. Offering views of Mondulkiri Highlands, Mayura Hill Resort is situated in Sen Monorom. Free WiFi is available throughout the property. Villas are air-conditioned, fitted with cable TV, a DVD player and a minibar. The en suite bathroom includes a rain shower and free toiletries. Surrounded by lush tropical plantation, Indigenous People Lodge features traditional and eco-friendly accommodation with calming views of greenery. Fitted with thatched roof and wooden flooring, cosy bungalows include a balcony, a fan, linen and mosquito net. Bungalows come with an attached bathroom offering towels and shower facility. Finally, these are an only a few things to do in Sen Monorom Cambodia that you should not miss. You will need no more than a few days to see most of Kampong Cham. It’s still worth a visit. And that’s it for now! Let me know if you have any questions and let me know if you go too. 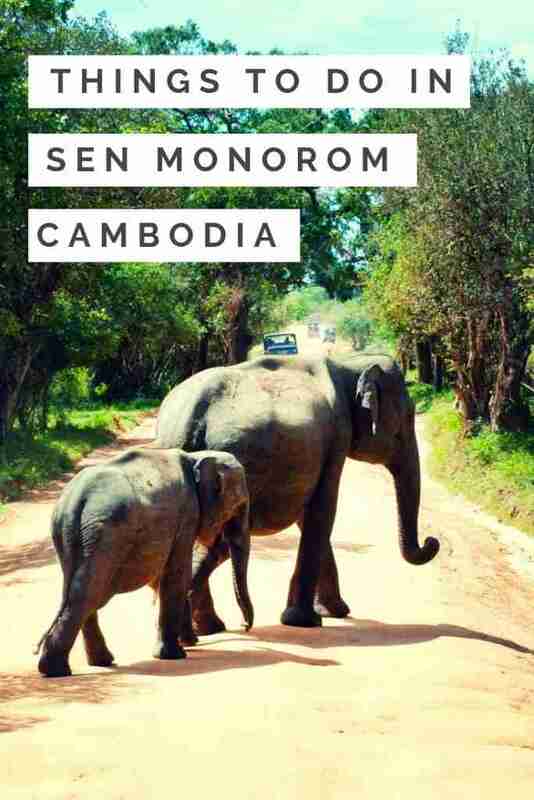 I’d love to know if this guide on the things to do in Sen Monorom Cambodia has helped you.